Summer is Here!Total Comfort can install your air conditioning system in Ormond Beach today! 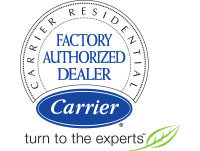 Turn to the experts!Total Comfortis a Carrier Factory Authorized Dealer. No Subcontractors usedOnly Trust CertifiedTotal Comfort employees background checked by Ask the Seal. Rapid advancements in technology in the air conditioning industry make the selection of modern equipment more highly technical leaving many home contractors behind. Accoprding to EnergyStar, a division of the Environmental Protection Agency, more than half of all air conditioners in the United States are installed incorrectly,. With thousands of comfort systems installed , our competency, proficiency and skill makes the difference. At Total Comfort, we have developed procedures to effectly evaluate your home in Ormond Beach. We can recommend the right equipment and install it the right way. These procedures focus on three key areas: System size, home application, and installation. Why? Because 90% of installations fail to perform one or all of these functions - resulting in a loss of up to 50% effeciency. In short, the evaluations and installation process has a greater impact on your wallet and overall comfort than the equipment you choose. We only install new equipment that utilizes environmentally friendly refridgerant. Accurately set blower speeds which correctly correspond to the system capacity. This is critical on variable speed applications.